Sunday I had my first flea market experience at the Long Beach Antique Market. I expected a cross between a giant, junky garage sale and a farmer's market but it was neither. Vender after vender offered a collection of carefully selected items for the home and garden that may have been secondhand or even eleventhhand but that were tasteful and interesting. Any object with a good story behind it makes it that much more desirable in my mind. My sister had a mission: lamps and a small table. I was just along for the ride...or so I thought. After getting a hot cocoa and a salted pretzel, and cruising down the long aisles of random goodies, I was determined not to leave empty handed. Not long into our visit I came across a gorgeous set of vintage Tiffany champagne glasses. Next I found a pair of crystal decanters in perfect condition. 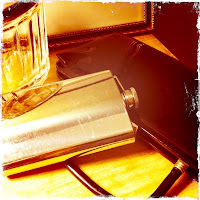 Then I discovered some fun retro bar signs, followed by a few prohibition-era flasks. The latter I couldn't pass up and plunked down a whopping $6 for a 16-ounce sterling silver hip flask. Now that I know what to expect, I can't wait to go back. My home bar is going to be updated with a few used treasures from the past.